If you’re going to be evil, you might as well do it in style. Why steal the largest gem in the world unless you’re going to do the moonwalk while doing it. If you’re going to destroy Hollywood, then you should probably do it with a giant robot, shaped like yourself. While you’re at it, you may as well be making all of your weapons out of seemingly harmless bubblegum. Maybe you should even dust off your keytar to battle against the Anti-Villains League. And you should definitely be wearing some ultra-sweet shoulder pads from the 80s. Actually, maybe you should just take a note from the “Evil Bratt” and just dress up like Balthazar Bratt from Despicable Me 3. Yes, you can be a “Baaaad Boy” too when you wear this licensed Balthazar Bratt costume from Despicable Me 3. 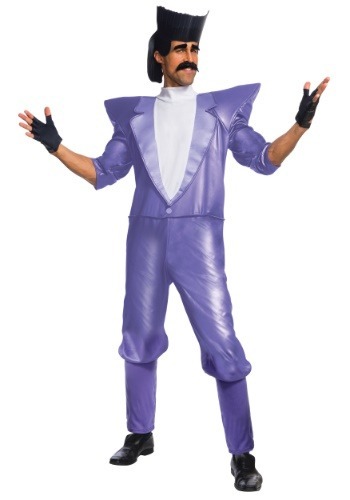 This costume comes with the purple jumpsuit designed to look like the purple suit worn by Evil Bratt. It even has some exaggerated shoulder pads that help you feel a little bit stuck in the 1980s and a little more evil. It even comes with a headpiece and mustache, so you don’t have to grow out a wicked 80’s hairdo or head to the barber to get the look. It also comes with those rad fingerless gloves, which are a must-have item for any super villain.